What a Journey and what an Experience of having HT from Dr Bhatti. There are many words that describe Dr Bhatti….but I will just use one word… AMAZING!! Over the last few years many patients have gone to Dr Bhatti for their HT and posted their reviews on the forums. I have decided to present my review a bit differently. I intend to make it simple and as user-friendly as possible. There will be loads of pics from my HT, including pics of Dr Bhatti’s clinic that no one has seen before. Then there is a review of each of the 2 hotels that I have stayed in. I have also included my impressions of other HT clinics that I visited while I was in India. I had my first HT about 4 years ago and that was FUT (1800 grafts to front scalp). Almost 3 years ago I decided to look around for other clinics for my second HT. I searched most of the hair forums to decide which surgeon was best for me. This time round I wanted to have FUE as I felt this method was best suited to me and it’s healing process is also much quicker. 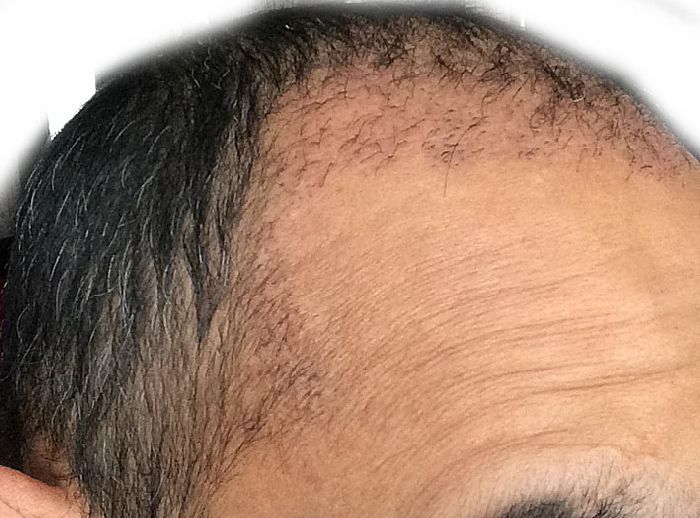 I was lucky enough to meet Dr Bhatti back in June in Europe for a hair consultation and he suggested I would need between 2000 to 2500 grafts from hairline to mid scalp. 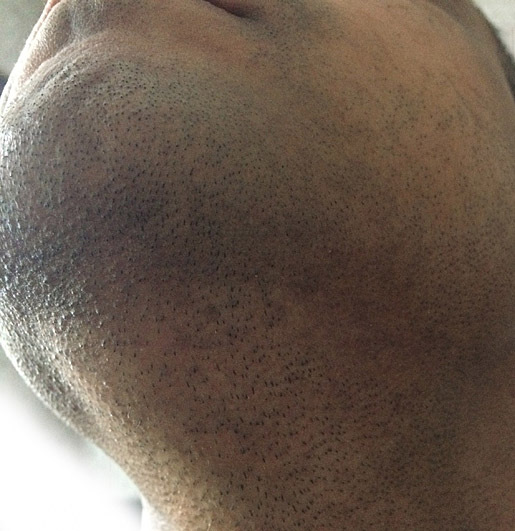 I mentioned that I wanted some beard hair in my forelock area, making it heavy in density, Dr Bhatti agreed to this and I was told that that around 400 – 500 grafts would be needed. 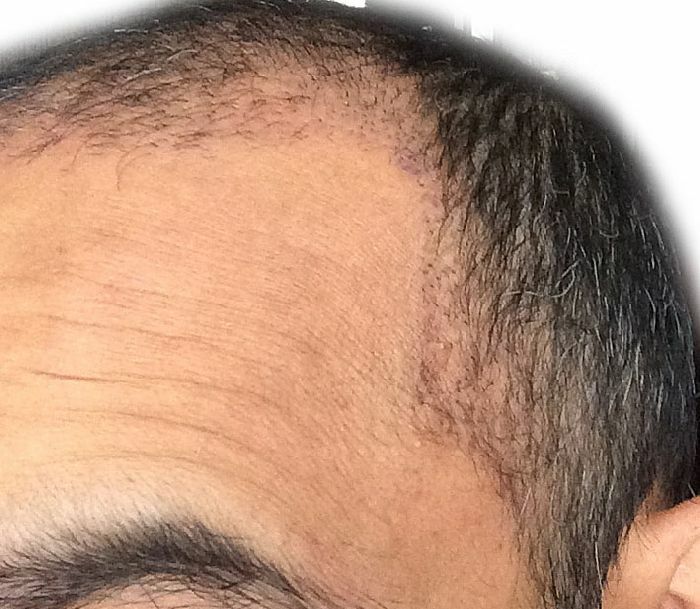 A hairline was drawn that Dr Bhatti and I were happy with. I arrived in India a day prior to my HT. Dr Bhatti’s driver Sachin (fantastic guy) picked me up from Delhi Airport and dropped me off to Altius Hotel in Chandigarh at 10 am on 20th October. He agreed to pick me up the same afternoon for my meeting with Dr Bhatti. 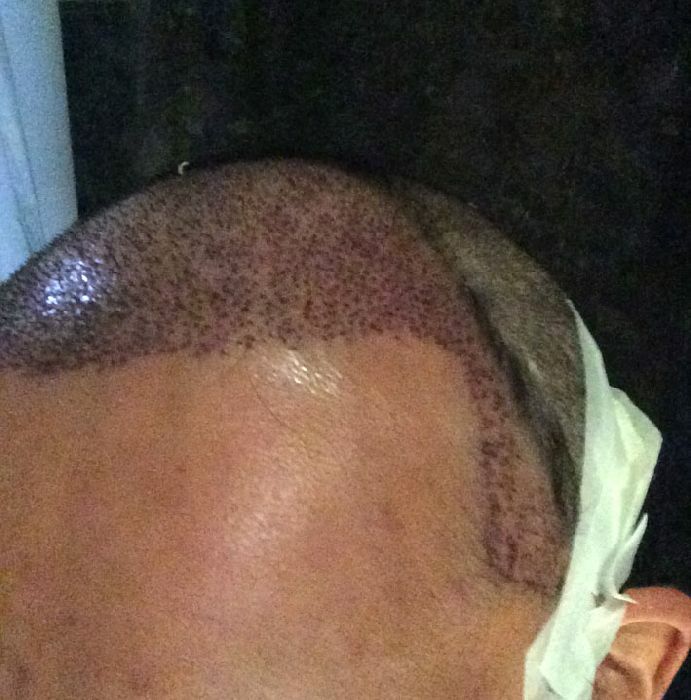 At the meeting we discussed the final aspects of the HT procedure and also redrew the hairline. This was to mainly accommodate any changes that may be required. Meeting Dr Bhatti again at his clinic was immensely comfortable and he put me at great ease regarding the procedure. I was delighted to learn that the procedure would go ahead, as previously arranged, on 21st Oct starting at 10am. The clinic carries out 2 procedures a day, big procedure of 2500+ grafts starts around 7.30am and second procedures usually for under 2500 start at 10am. As advised I arrived at 10am, had my blood test done first, once I passed this …lol then I was good to go. My personal belongings were put in a safe and I was told to change into an operation theatre gown. 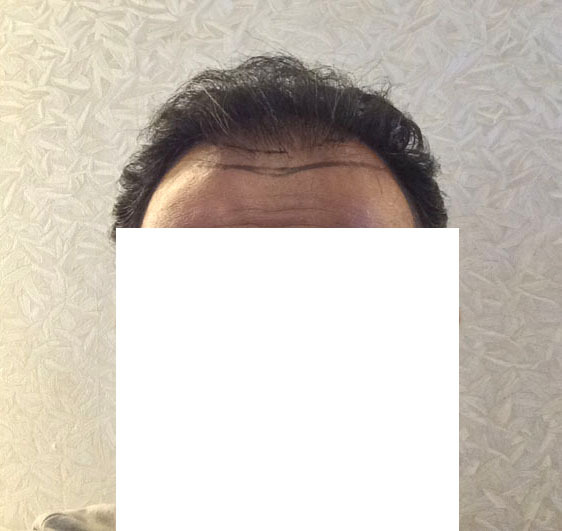 My hairline was redrawn and then Dr Bhatti gave me a lovely haircut, after this the nurses/techs took over and they washed my hair with special Shampoo. After this I was taken to OT for harvesting. I was told to lay face down in the operating chair so that Dr Bhatti could apply the anesthetic to the donor area. The pain of receiving anaesthesia was tolerable. Also, it wasn’t too difficult finding a comfortable position while the grafts were being extracted although I was lying on my stomach and my head was being turned from side to side. While Dr Bhatti was making the punches, his tech picked out the grafts from the donor area. In the end, Dr Bhatti was able to get 1888 grafts from donor area. 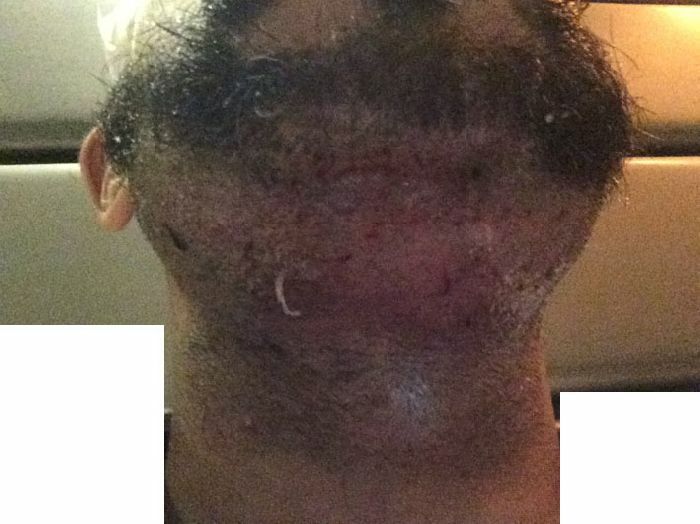 A local anesthetic was applied to the beard area, which I think was the worst part. 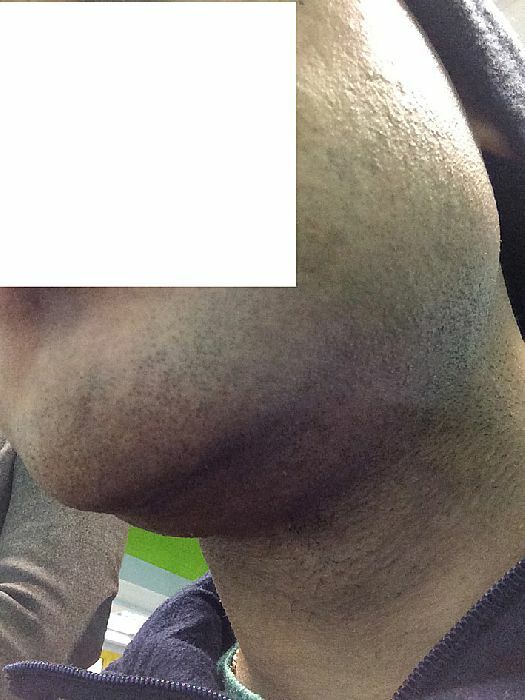 I was in a lot of pain but Dr. Bhatti was very efficient and carried out the whole process without any issues. 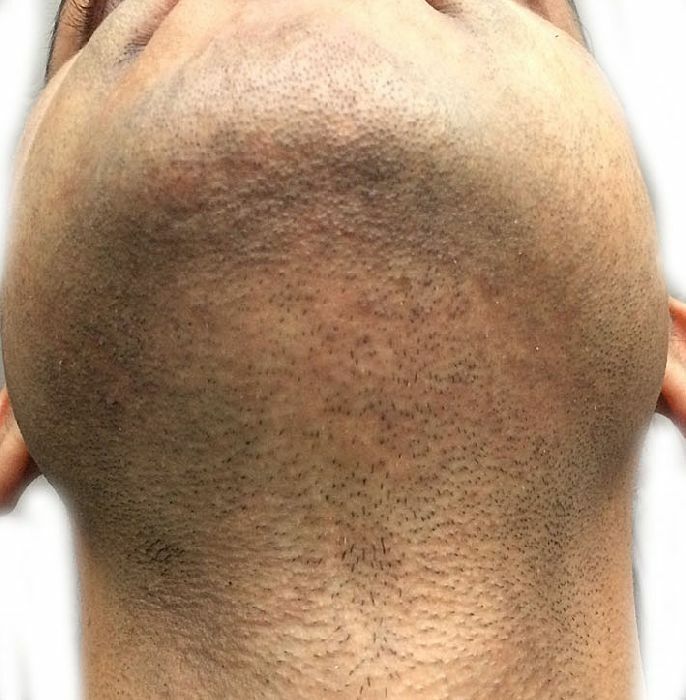 In total 465 grafts were extracted from the beard area. The harvesting procedure took just under 3hrs. 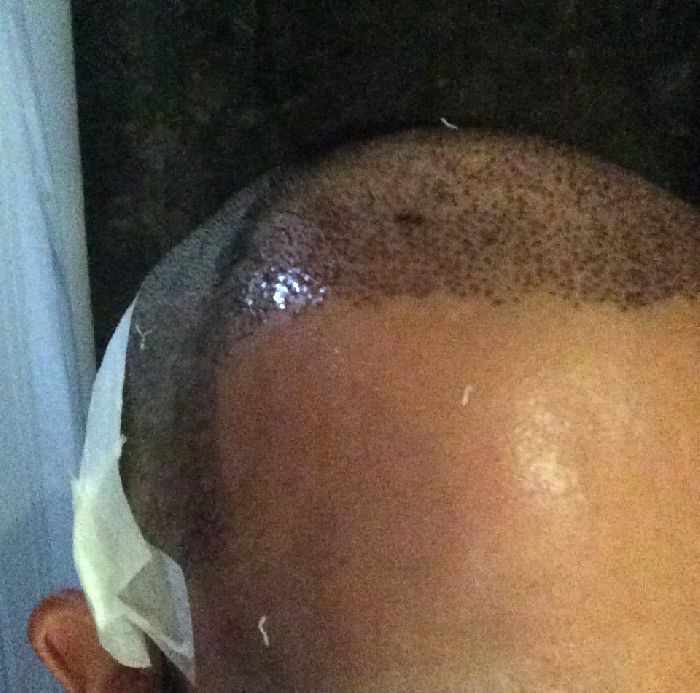 Then slits were made in the scalp for the grafts to be planted from the hairline going back to mid scalp. While Dr Bhatti was making the holes, I was getting a weird sensation as I could hear a crutch noise for each hole that was being created, so I heard this over 2000 times…lol. However no pain or discomfort was felt. Then there was a quick coffee break and some lunch after which it was time to implant the grafts into their new home by the techs. I clearly remember that the implanting started at 3.15pm and we finished around about 6.45pm. During the process Dr Bhatti had to extract a further 200 grafts from the donor area. He also kept an eye on the proceedings by visiting the OT room every 10min or so. 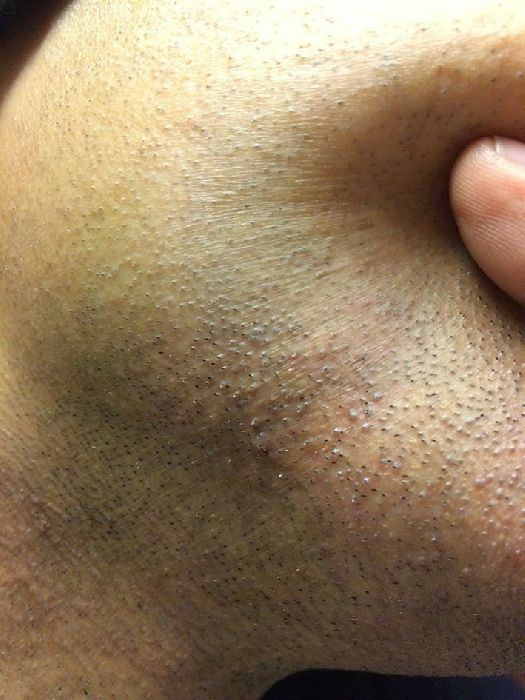 Dr Bhatti kindly enough planted some grafts to my FUT scar, around 50 grafts on each side of the scar. I must mention that the staff at the clinic are wonderful, each one knows what role they have to do from Admin Manager to Tech implanters. I believe the grafts implanter was Ms Parneet and assistant nurses were Tina and Pooja. I would like to thank them for being patient with me and for keeping my mind occupied while I had the HT procedure. Once the procedure was over I was given explicit instructions to spray saline solution every 20mins to my grafts till midnight. 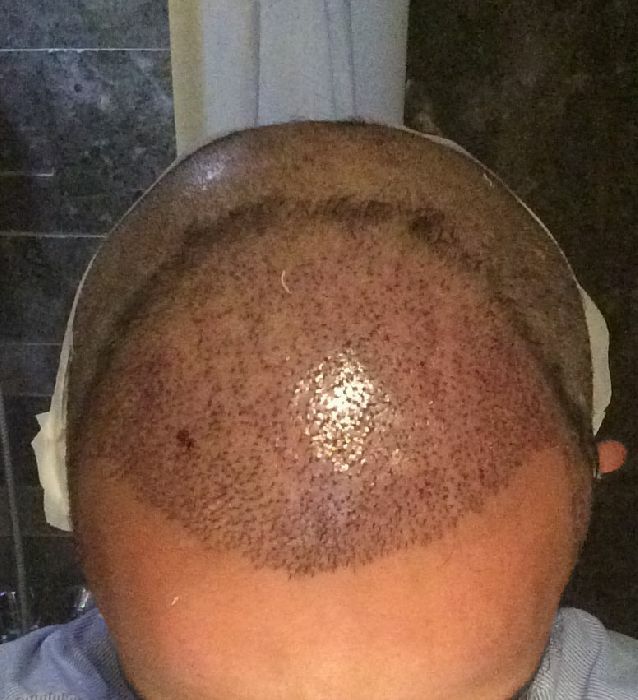 I was told to sleep on a chair, as I could not rest my head against a pillow due to having some grafts in my scar. I was back in my hotel by about 7.30pm. Now after having to spray every 20mins I must have slept only for 1 hour. Next morning Sachin picked me up at 9am for my first hair wash and I was given medication for the next 14 days. 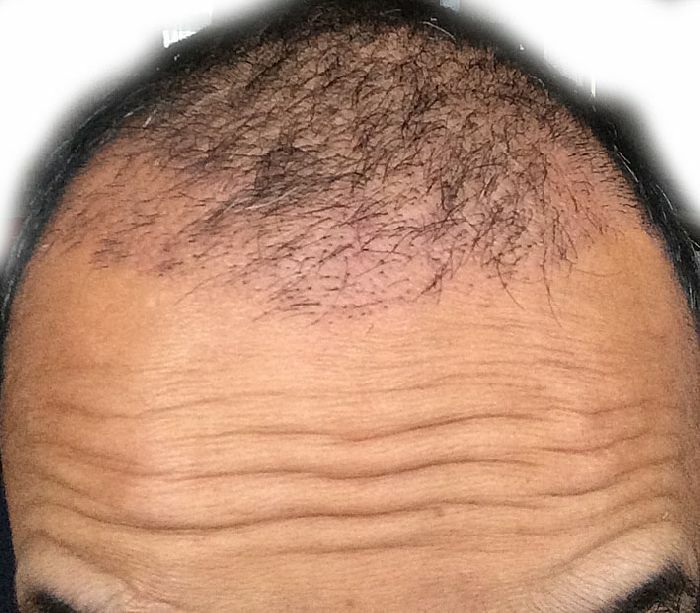 Dr Bhatti also supplies other medication such as Botin, finasteride, Mintop (Minoxidil foam 2% and 5%) for about ?50 pounds, which will last 6 months. 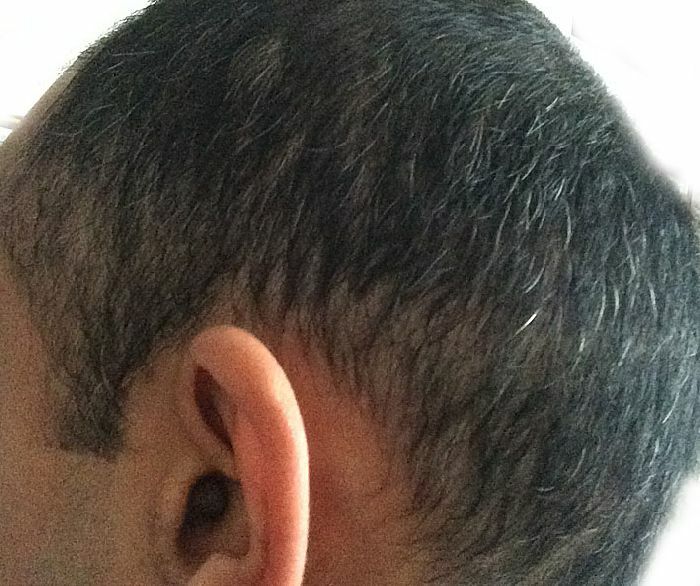 There is a very short video that Dr Bhatti kindly firmed of the techs planting the grafts in my scalp, hopefully I will have this soon from the clinic. The grafts have settled in well in their new homes now….lol. I guess I have been very protected since my HT, not scratching my recipient area for the first 3 weeks, washing my head very carefully and gently. I’ve started to shed most of my transplanted grafts now and my native hair/previous HT grafts have started to grow well. The donor area can get very itchy some days but it’s healing well day by day. 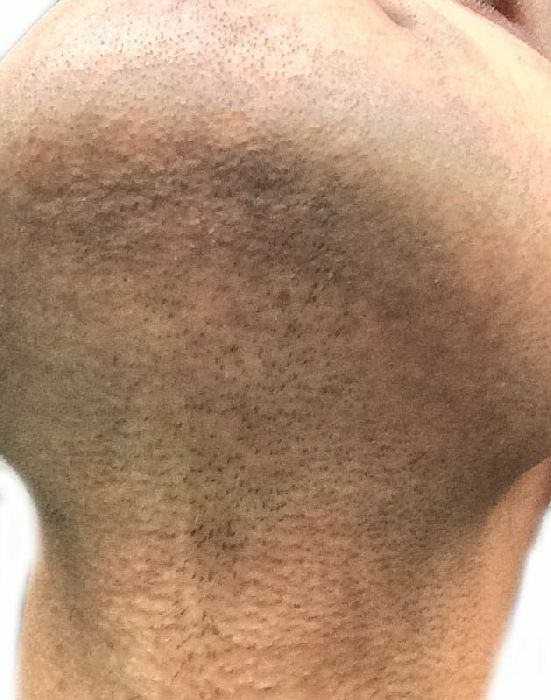 I’m very impressed with my beard donor area, I can’t see any visible marks of extracted grafts, even my partner was surprised how well it looks after I month. I have attached some photos that were taken today after my shower, please note I did not bush or comb my hair before I took these photos. At the moment I’m only taking Rogaine foam and Biotin tablets. I’m still not sure if I want to take finasteride tablets. Thanks for reading and I’m happy to answer any questions.